Applications Engineering is a specialist supplier of differential pressure switches, suited to a variety of engineering applications. Our range is ideal for process control in safety-critical environments, and is commonly used for systems in chemical and petrochemical processing, the oil and gas industry, and energy facilities, including nuclear plants and water management. 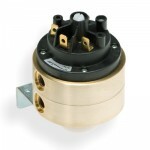 The pressure switches we offer have been selected for their quality, reliability and economic design. Our components can be used for any general industrial pressure monitoring system, and we offer specialist pressure switches available for more specific or demanding requirements, such as marine environments. Differential switches are used to sense pressure differences between two points in a system, and actuate if a pre-defined difference is met. Across the hundreds of varieties of pressure switches, three things remain constant: a sensor (either bellows or diaphragm), a spring for determining the range set point and a snap-acting micro-switch. When the pressure difference between the two ports becomes too great, the force on the diaphragm or bellows overpowers the tension set in the spring, causing an axial movement balancing arm or similar mechanism. This actuates the micro-switch which contains the electrical contacts. At Applications Engineering, we are proud of our customer service and highly competitive rates. Our products represent great value, and are rigorously tested for safety and offer exceptional durability to ensure your complete satisfaction. If you’re not sure which of our differential pressure switches is best for your process, the Applications Engineering technical team are always happy to offer expert recommendations. Call us today on 01825 764737 or use our contact form on this page.